This is by far THE BEST book I have read on the subject. I\'ve been really inspired from it. I\'ve read it only once but I\'m quite sure that a full comprehension needs more work! It\'s amazing how much stuff is involved in being competitive in IPSC which I didn\'t even considered until I read this book!! Thank You very much Saul for sharing all this stuff with us! Great book! Read it using a marker. Should had bought it way sooner. Хорошая книга для соревнующихся спортсменов, тут вы найдете освещение вопросов психологической подготовки, тактики и стратегии как прохождения отдельных упражненений так и всего соревнования в целом. "Perfect practice" est un guide essentiel pour le tireur débutant et pour ceux qui cherchent des idées pour améliorer la technique. Des exemples d'exercices bien pensés. Both books have something to offer me who is new to the sport. Like any sport that one falls in to there is often little training but lots of advice on the circuit - some good, some not. These books offer me a way of getting some structure around training and thinking about the sport. Are they perfect? Of course not. But they are another tool to be used. 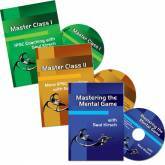 A great read which covers a vital aspect which is often overlooked - the "mental game". 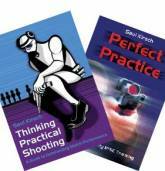 Written in simple, clear language, this is an essential addition to any IPSC shooter's library. Get both of Saul's top selling IPSC books! The best investment you will even make in your shooting! Usually you would pay 54.5 Euro for these 2 titles. Get them here for only 49.5 Euro!, You save 5 Euro!